Began as an ode to the abstract film practices of Làslò Moholy Nagy and Oskar Fischinger from the 1930’s, “aokee” is a short experimental video of a sculptural form presented to the viewer in a state of constant flux. The work is an attempt to capture a sensation, akin to a “stasis field”, whereby time is suspended/distorted for a certain period before being restored to normal. Oscillating between states of augmentation and entropy, “aokee” is essentially a simple play of moving image, colour and uncertain space. The writings of the “Oulipo” group - Georges Perec and Raymond Queneau in particular, and their use of closely defined constraints within the creative process, has influenced the framework for this video and helped define the specific roles of discipline and play. “aokee” was shot within a makeshift environment built in the studio. At its centre stood a sculpture, placed on a rotating platform and with moving mechanical parts built into its body. 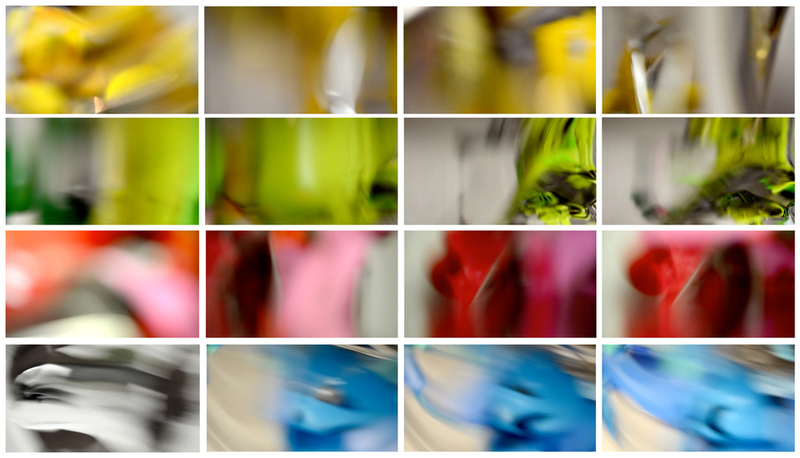 The process involved filming the sculpture out of focus and through various refracting mirror/chrome surfaces. This is effectively an exercise in abstract, analogue moving imagery. No digital effects or computer generated imagery was used in the process. The visual imagery is complimented by a musical composition from Konstantin Heuer (Kammerkonzert 1) played by Neophon Ensemble.